Food Report for of Novembre 2016. 1 cup of dehydrated beef crumble / person. Step 1: In a pan fry the beef crumbles at medium heat. Until well cook and nice smelling. Step 1.5: Hydrate the cheese if you have dehydrated cheese. Step 2: Add the syrup and the onions in the pan, and mix while cooking. Step 3: Put the Nachos in the oven at 350F for 10 minutes. Step 3.5: Shred all the cheese if you don’t have dehydrated cheese. Step 4: Once ready take the Nachos out of the oven, and spread the shredded cheese all over the nachos chips. Step 5: Put the cheese cover nachos back in the oven until the cheese is well melted, then serve. Step 6: In a bowl, take some Nachos and cover them with the cooked beef crumbles and some Salsa. Step 7: Enjoy with you friend while watching hockey, football or Martian soccer. 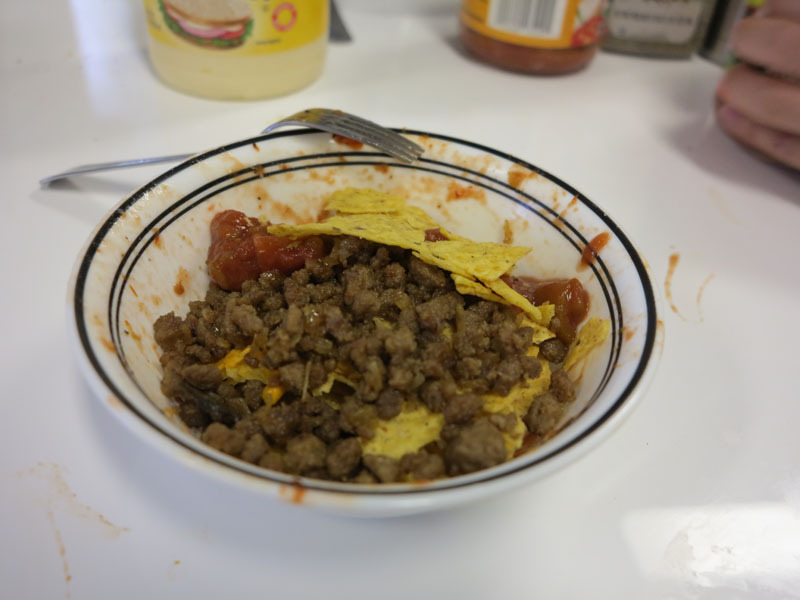 We were supposed to get nachos that night, but because of the limit of our tool, we decided to combine the nachos and the beef crumbles in a spectacular delicious mess of cheese, carbs and corn chips.